Ok listen. 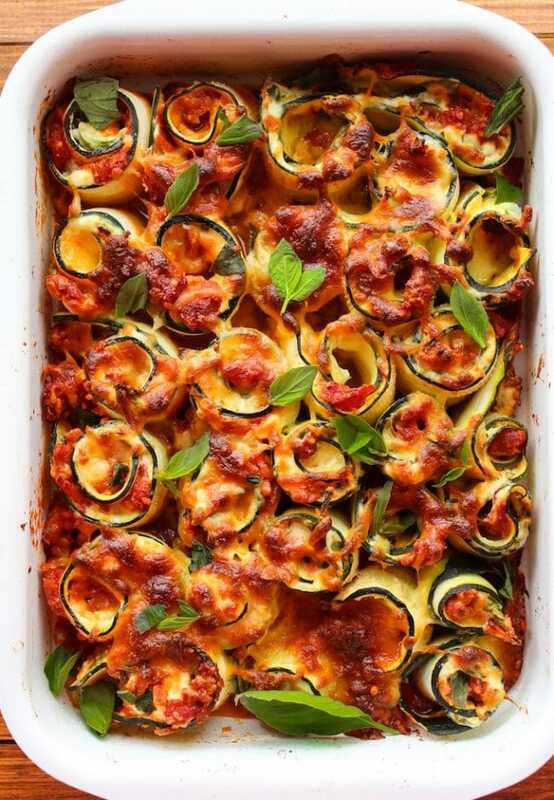 I realize that this zucchini lasagna looks extra fancy (translation: more work) because of all the spirals and everything, but hear me out…. They’re not actually hard to make at all! It only took me an extra 10 minutes to stuff and roll which always goes by in no time for me since I like listening to music and podcasts when I cook. And I mean, how cool does this look? I’m a sucker for pretty food. Not to say that the taste doesn’t matter as much. It’s just the cherry on top of a really fab ice cream Sunday. Ya know? At any rate you’ll forget all about how much time you may or may not have spent making this because it’s that good. There are a few ways you can go about to make your zucchini slices, but the easiest way is to use a kitchen tool. I used a handheld Mandoline slicer to get my slices, but you can also use a julienne peeler like this one to get long thin, pasta like noodles. If you don’t have access to either of those, you can slice the zucchini lengthwise by hand. Just know that it might take a little more patience slicing the zucchini to the right size. You want the zucchini to be thin enough that you can roll it up without breaking, but still thick enough to hold up when stuffed and rolled with cheese and sauce. When your zucchini is rolled up and ready to be placed in your casserole dish make sure that you set them down so that the seam side is up against the edge of the dish. This will help prevent any rogue zucchini spirals from opening up before you’ve filled up your pan. 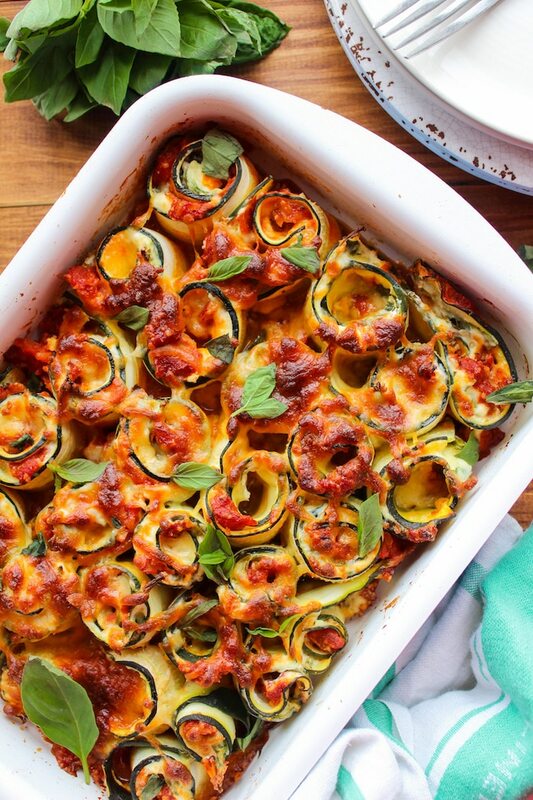 Despite being such a hearty dish this zucchini lasagna is also pretty light being that it uses zucchini as the pasta substitute and it’s filled with veggies. If you have any extra garden veggies hanging around go ahead and chop up whatever you have and toss them in. You can scatter them along the bottom of the dish or mix them into the marinara. Bonus: these make for great leftovers! Don’t forget to #asaucykitchen on instagram if you try this vegetarian zucchini lasagna I’d love to see what you make with it! You can also post your pictures to my facebook page! Lay the zucchini strips out across a cooling rack (cooling rack allows excess water to drain). Sprinkle salt across the tops of the zucchini and let sit for about 10-15 minutes to let the water sweat out of the zucchini. Pat the water off the zucchini and then flip them over and repeat with the next side. Wipe off excess salt with a towel. Warm the olive oil in a small sauce pan over a medium heat. Add the onions and sauté for about 3-4 minutes until the onion softens. Remove the sauce from the heat, take out the bay leaf, and allow the marinara to cool for a couple of minutes before handling. In a medium bowl mix ricotta cheese, basil, spinach, parmesan cheese, half of the mozzarella and egg. Stir well. In a 9x13 in (22 x 33 cm) casserole dish spread 1/2 cup tomato sauce on the bottom. 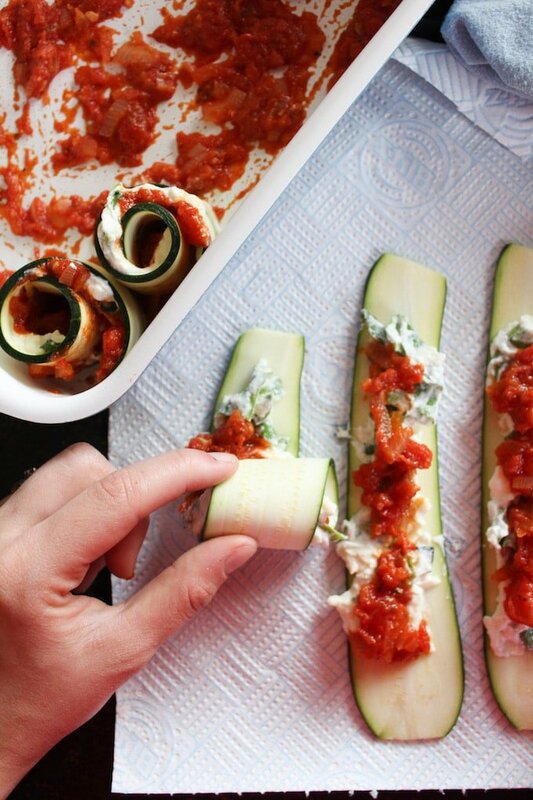 Begin assembling your zucchini rolls by laying out the sliced zucchini noodles on a flat, clean work top. Spread about 2 tablespoons of the ricotta mixture first over each individual zucchini noodle. Then, add a spoonful of marinara over the top of the ricotta. Carefully roll up the zucchini and place them in the baking dish. If you have any remaining tomato sauce spread it over the top of the rolls. Sprinkle parmesan and the remaining mozzarella cheese over the top. Bake for about 45 minutes or until the cheese on top is a nice golden brown. So good!!! Trying to reduce our meat intake and no complaints from the husband! The 7yr old eating zucchini as pasta would have been a bit much, so we did 1/2 your recipe and 1/2 with no-cook lasagna for him. 1/2 recipe was enough for the three of us. So good!!! Aww so glad you guys liked it! Thanks Jenelle! Great recipe! I made it last night. I didn’t have the tools to make cute slices nor the patience/time to cut them with a knife, so I just sliced them as thin as I could and made it into a regular lasagna with layers. I used 2 zucchinis and 3 yellow squash, turned out great. It was enough for 8 people. We had one vegetarian, 2 on keto diet, and the rest were big meat eaters who didn’t seem to mind the absence of meat. Everyone liked it. Certainly a keeper. This recipe was a major WOW! I used fire roasted diced tomatoes to give it a bit more of a kick. It looks so cool, and the taste is amazing!!! This is my first time on your blog. You can bet it won’t be my last. Thank you for a definite keeper of a recipe. Yay! Thanks Sharon, I’m so glad you liked it! Thanks so much for coming back to let me know what you thought! This turned out so good! Much better than I thought it would. I have an absolute loathing of squishy, soggy zucchini and I was afraid that’s how it would be, but NO! I will say it’s hard slicing zucchini in decent strips so I will be investing in a mandolin. That makes me so happy to hear! Thanks so much for coming back to let me know what you thought! Does this reheat well? Or should I halve the recipe if we won’t eat it all in a night? I made this today and absolutely loved it! Thanks for sharing your recipe! So glad you enjoyed it! Thanks so much for coming back to let me know what you thought! Good zucchini is really hard to find here the time of year. Do you think I could make this with eggplant instead? Yay! Glad you enjoyed it! Thanks for coming back to leave a review/comment! I’d be wary of prepping it all in advance – zucchini has such a high water content, if left over night with the spirals & cheese I’d be worried it would make things too soggy. If however you wanted to prep everything individually the night before you could certainly do that! Hope that helps! looks beautiful enough to not miss the pasta! Inspired recipe! Thank you for this great idea for a recipe! Thanks Sabrina! Hope you enjoyed it! The recipe came out great! Any way to figure out how many carbs are in a serving? It looks very pretty however, I followed this recipe to the T and the whole casserole dish filled with a watery juice as it cooked. Literally all the way to the top. Half way through I had to use a baster o remove all the fluid. I was left with soggy rolls. Perhaps soaking the zucchini in a salt water solution and allowing to dry before assembling could help pull some of the moisture out prior to baking? Hi Nicole! I’m so sorry that this didn’t turn out right for you! I’ve made this several times, and I’ve been tagged on Instagram with pictures of other people who have also made it. I know zucchini can be tricky to work with though because it’s got such a high water content. I’ll make a note in the recipe with your suggestion for future use. Thanks for coming back to leave a comment – I do appreciate the feedback! I am planing to make this for dinner – it looks beautiful! 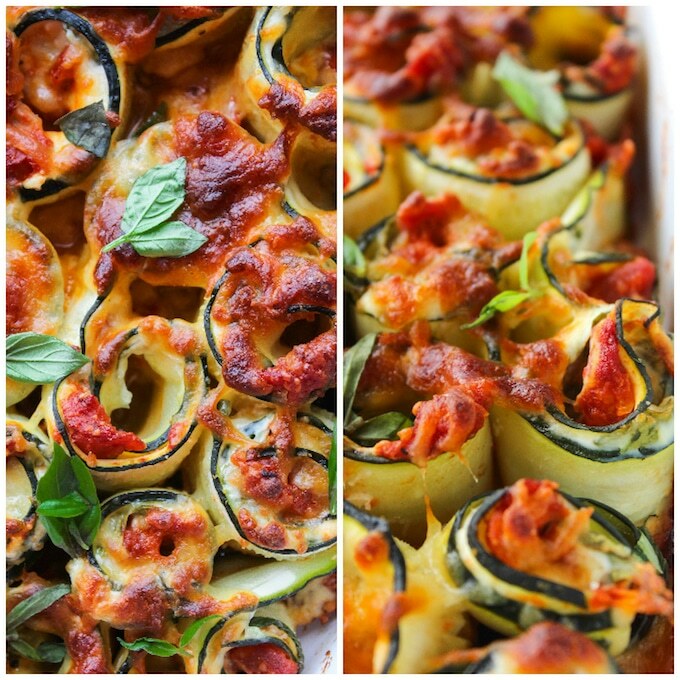 Love lasagna but this version with zucchini is just perfect – low carb! Thanks for sharing this recipe. Thanks Thea! Hope you like it!